Many of you know of my singular and all-encompassing love of the ramen noodle. In particular, the spicy version known in Japan as “Tantanmen.” Slurping, sloshing and spraying this delectable carb on other patrons at the ramen bar is an experience which causes me to rip off my paper bib, jump off the bar stool my arms raised in praise, and clap to the rhythm of the gospel choir singing ramen praises in my head. While Andretti-san and the other salary men act like I`m not in the restaurant. 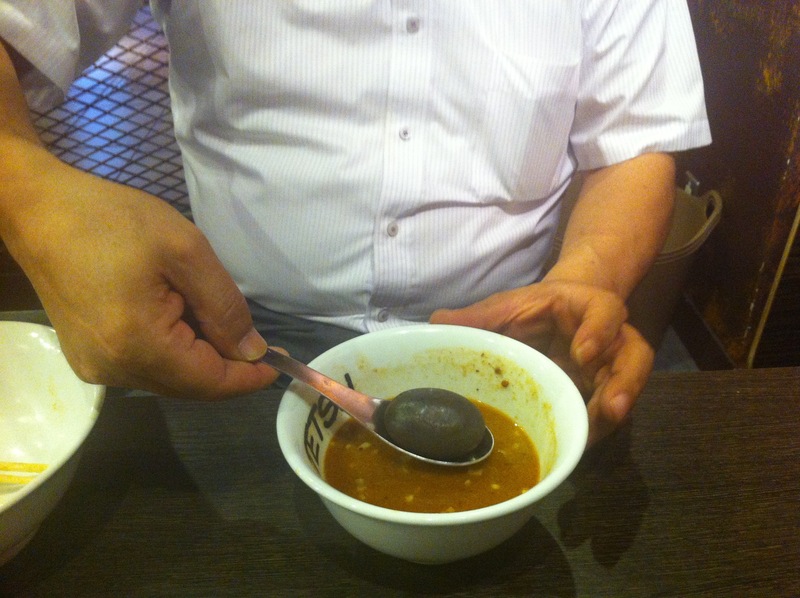 My love for the tantanmen is not unconditional as all are not created equal. Finding the Holy Grail of ramen, the one true tantanmen, has become my quest. Together with Andretti-san, my unwilling partner and taste tester, we comb and scour Tokyo seeking out other converts who can provide witness to the one true, all hallowed ramen. After spinning at the gym when many of us are craving carbs, candy and a cold beer, one poor woman got off her bike and collapsed on the floor, babbling all tongue-tied over a recent ramen rendezvous. Immediately I whipped out my iPhone to note the details as this could be it. Intriguing in that this brand of ramen employed a gimmick.. This gimmick was a hot rock. Located in the lowliest and most humble of settings- a train station. No matter how arduous the journey, we had to go. Well, I wanted to and Andretti-san went because I paid. The place was filled with salary men all wearing white shirts and black pants- and me. The reason Japanese women are so thin is that they don`t down lunches laden with 2500 calories per bowl hence their absence at the ramen shops. This is also the reason I am the only American to move to Japan and put on -rather than lose- 20 pounds. 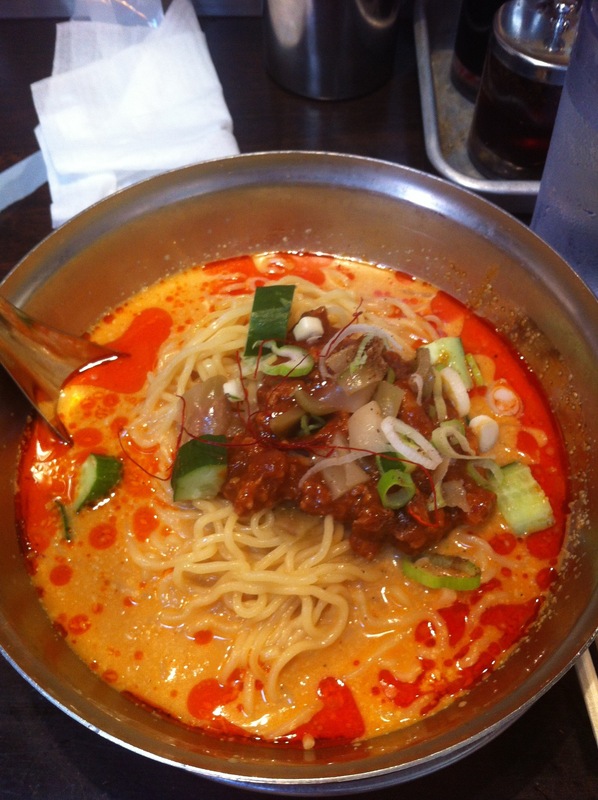 All that aside, we ordered the spicy version of the rock ramen. Neither one of us noticed the taste we were so enamored with the gimmick. In order to observe the ritual appropriately, we consulted the sacred texts. According to the historical teachings, we were to add dashi (Japanese soup base) from a sacred urn on the table to the remaining broth. A hot rock was delivered to the table after Andretti-san chanted in Japanese. He then performed the service. Fire and brimstone mixed with the broth for a delightful show. Salvation? Redemption from a long day at work? Or a half day in our case? Maybe. My friend failed to tell about the free facial steam with every bowl. Not the rock on which to build our future but still worth a try. My spinning friend says that after a while a craving develops and she finds herself elbowing her way in to the station shop. This is still the one I crave. Japanese people say there`s no reason to make homemade ramen when it`s so easy to buy it. The frozen version of all Japanese food- including tantanmen- is damn good. Not like the styrofoam food we Americans choke down from the freezer section. 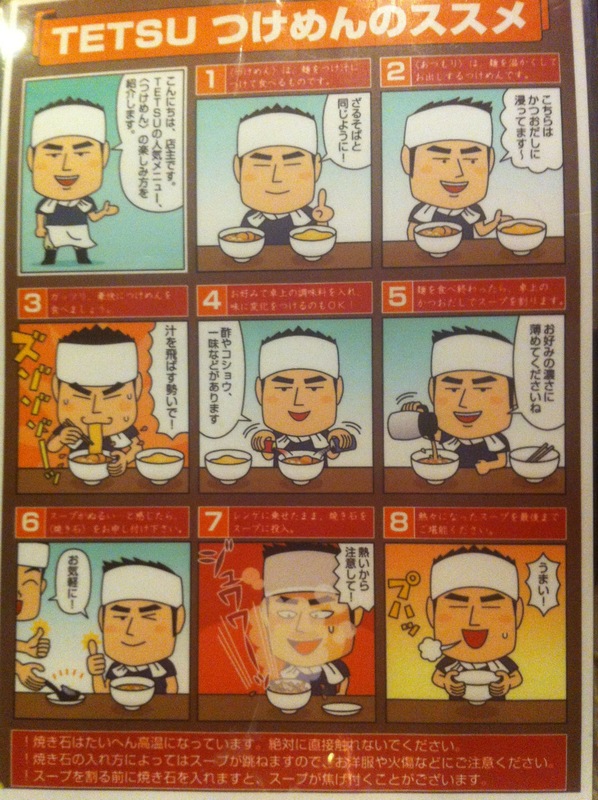 Andretti-san has told me the only way I`m going to get the recipe is as a cook at the ramen shop. 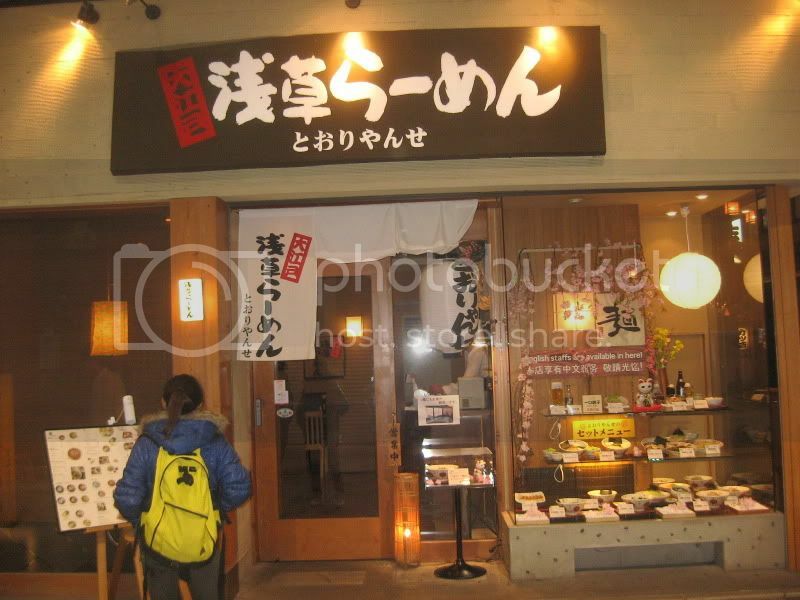 In the meantime, I`ve begged “Japan Eats” to go get it for me. I`ll keep you posted. Once they unblock me from Twitter I should be able to share the recipe. 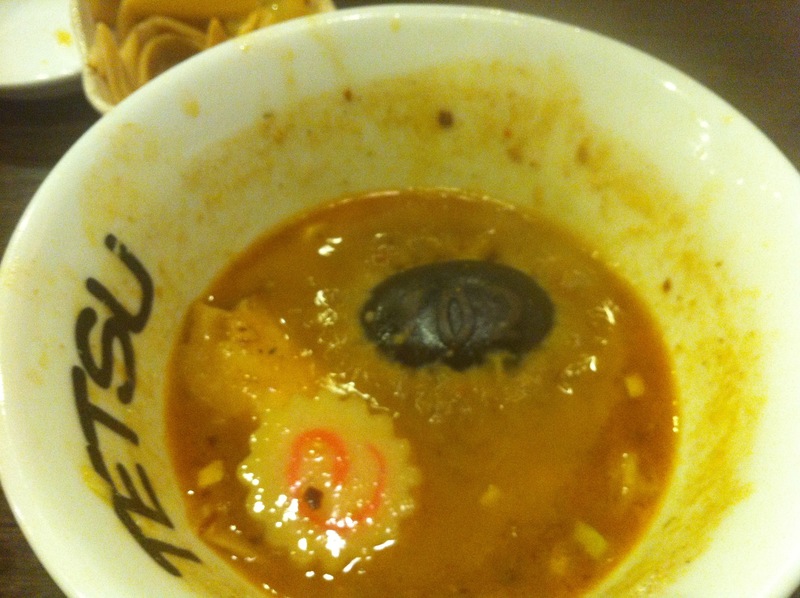 The rock ramen is at Tetsu in the Roppongi Metro Station and all kidding aside, it is worth tasting. I hear their special rice is really tasty too. 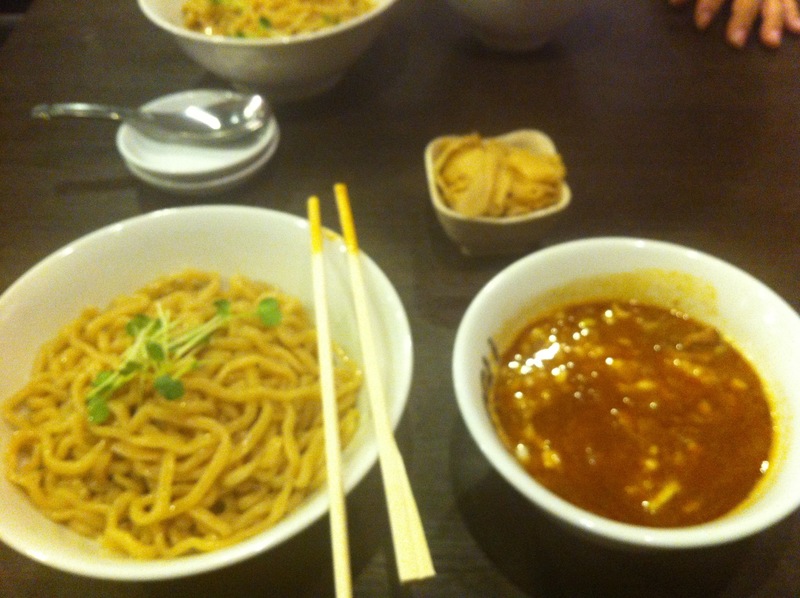 The Tantanmen pictured above is from Koh Men in Omotesando across from TGI Fridays. This entry was posted in Moving to Japan and tagged Amblerangel, Culture, Emily Cannell, ExPat, Hey From Japan- Notes on Moving, Humor, Japan, Moving, Ramen, Tantanmen, Tokyo, Travel. Bookmark the permalink. Hey, Always love your blogs!! Just wanted to say HI! Hopeing all is well in the land of the rising sun! Hey! I`m so glad you are settling in! I miss you! THN is next week so the next crop of folks is getting settled in here. Maybe next summer we can all swing through and meet? Adds whole new meaning to the notion of stone soup, doesn’t it? I, too, like Ramen noodles, but somehow I bet the ones we get here in KY just aren’t the same. Do you suppose the Nose would agree? Park- entertaining in so many ways, through Omotesando- entertaining in so many other ways- get a belly full of ramen- then back. This keeps our guests up until 7:30 or 8 after they`ve been on a plane for 14 hours which keeps them asleep for the full night and hopefully past the bewitching hour of 3am when everyone`s body tells them it`s time to get up. The Clampitt cure for jet lag. I can see that you’re going to have a new job in the near future! Does the rock add to the flavor of the noodles or is it just part of the ritual? It heats up the soup. So, I GUESS it adds value and is not just a gimmick. I think the dashi just waters down the good stuff. A lot of people like it. I like a really powerful flavor though. Most people here prefer a more watered down taste. 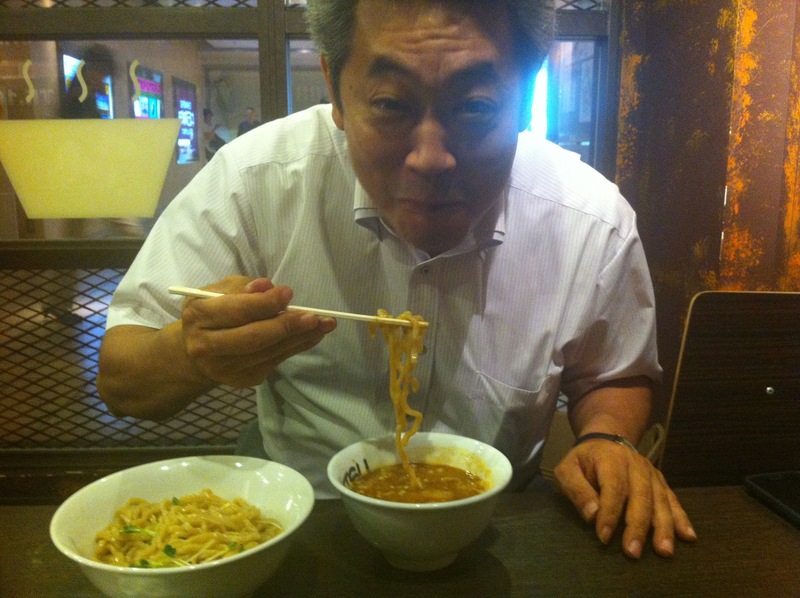 I am so hungry here in California – contemplating what’s for dinner – the ramen looks so good!! Wish I could copy it somehow here. I bet you can find tantanmen in a Japanese restaurant or ramen place somewhere in California….. Of course I have no idea where! I don’t know if you’ve tried this place yet, but there’s a restaurant in Asakusa that had amazing ramen. We went there for my daughter’s golden birthday dinner, and out of all the places we visited this was her favorite ramen. I don’t know the name because I don’t read kanji or hiragana or katakana, but it’s in the trader’s market just outside of the Senso-Ji Temple. I haven`t- Andretti-san and I will have to see if it passes muster!Thanks for the tip Blissflower! If you get a chance to try it, you’ll have to let me know what you thought. I actually have pictures of the ramen we ate in my photobucket account because I was documenting EVERYTHING while we were there. 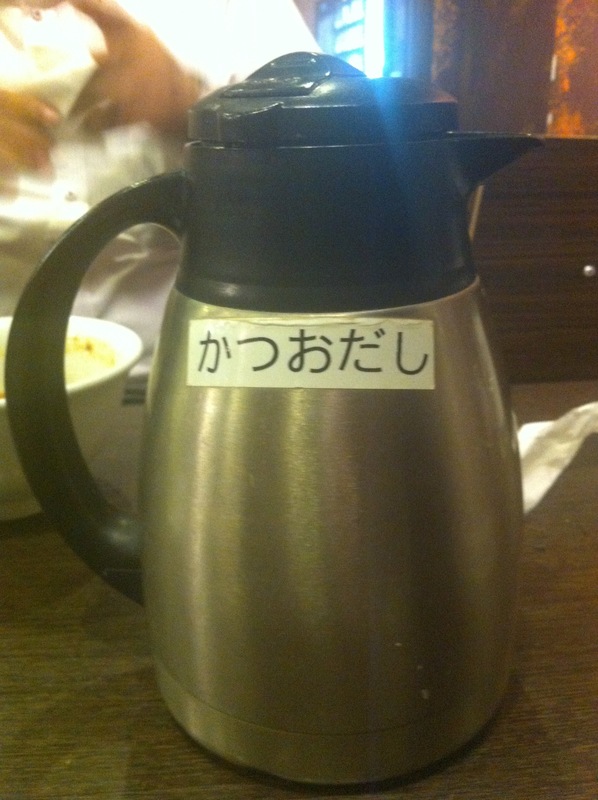 I also have photos of the omelette and bubble tea I had at the Denny’s in Asakusa. I’m weird like that. I`m exactly the same way. I like to remember the good- and the bad- of what I ate. My kids don`t even react anymore! I know this feeling — I am ALSO the only woman in the ramen shop. Perhaps someday our ramen paths will meet in the cellar of Tokyo Station. Living in Fukuoka, eating ramen is like a philosophy here. In Nagahama, you can see fisherman eating ramen at 7 AM and in different places, on Saturdays, foreigners and Japanese alike eating ramen around 4 AM before going home to bed. I think I need to move…Thanks Ben! So good to know that when I`m in the NE I can get my fix! My favorite ramen shop is not real keen on hiring me as a cook. There is a pic somewhere on my blog. There is some really good ramen around. 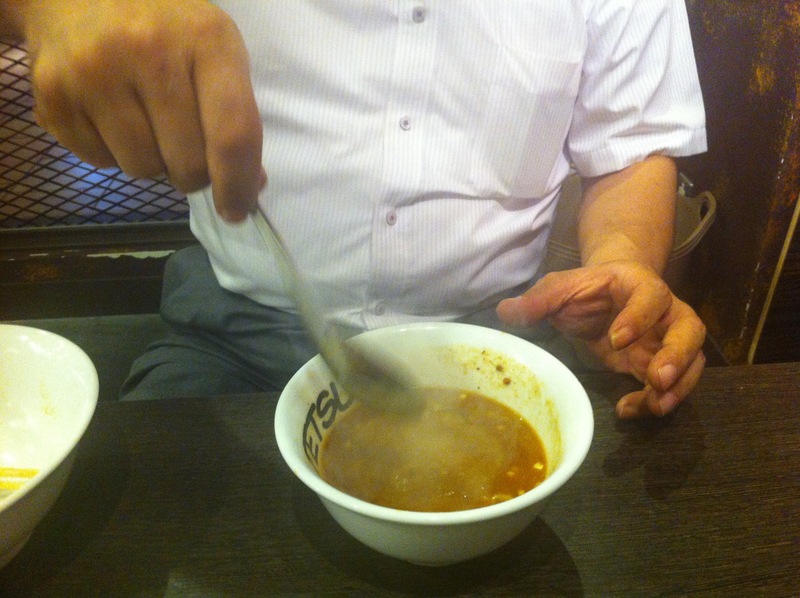 I also like hot and sour soup ramen….